In this third installment of the series, 11-year-old whiz-kids Nick and Tesla discover that someone in the quiet town of Half Moon Bay has placed their beloved Uncle Newt under electronic surveillance—but who is spying on him, and why? 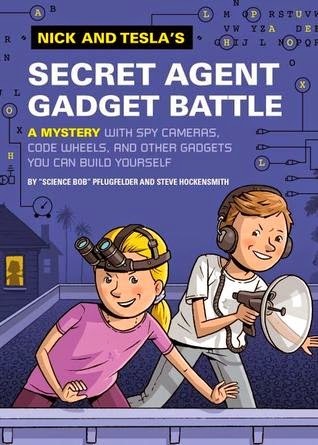 To expose the secret agent, Nick and Tesla build all kinds of outrageous contraptions. Throughout the book, the narrative is interrupted by blueprints and instructions so that budding young inventors can follow along. Science and electronics have never been so much fun! Another great story for Nick and Tesla. In this adventure they are trying to find out who is spying on them. The authors provided us with a handful of very humorous possibilities. I loved watching Nick and Tesla try to figure out each and every one of them. The techniques they used and the gadgets they build have instructions that are very easy to follow once again. It was a perfect mix of fun and education. My 11 year old daughter is loving this series as well.